The excitement is building in Salt Lake City with RootsTech due to open tomorrow morning. Thousands of genealogists and family history enthusiasts are converging on the Salt Palace Convention Center for one of the biggest genealogy programs offered each year. Stuck at home hundreds or thousands of miles away? Yesterday, The Legal Genealogist gave you the streaming schedule for the presentations that you can watch live from the comfort of your computer chair (see here for more info). Today, I want to tell you about one more thing you can do from home — and this one is both participatory and offers lasting value for the entire genealogical community. It’s an Index-A-Thon, it’ll happen Thursday evening, February 4, 2016, with livestreaming starting at 6:30 Pacific, 7:30 Mountainb, 8:30 Central and 9:30 Eastern. 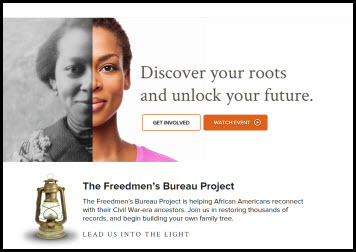 And it kicks off Black History Month as we all pitch in to index records from what’s become known as the Freedmen’s Bureau — the U.S. Bureau of Refugees, Freedmen and Abandoned Lands, established in 1865 by Congress to help former black slaves and poor whites in the South in the aftermath of the Civil War. Anyone who’s here in Salt Lake City can register here for one of a limited number seats in the computer labs to index in person. And anyone, anywhere, around the world, can index from home with nothing more than a computer, a FamilySearch account (yep, it’s free) and the indexing software (yep, it’s free, too). There’s a video done by FamilySearch’s Thom Reed that you can see here to give you info on how to do it, and on how to join in on the Index-A-Thon Thursday night. So… why Freedmen’s Bureau records? Because, simply put, these records are amazing, for descendants of all the slaves and all the slaveowners who struggled to redefine themselves, their lives and their communities after the Civil War. And for descendants all of the members of those communities who weren’t themselves slaves or slaveowners but whose lives were impacted by that struggle to redefine life after the war. And for descendants of the legions of southerners who weren’t slaves or slaveowners before the war, but who simply needed government help after the war. And for descendants of the legions of government workers and officials and teachers and relief workers who worked for the bureau. In other words, for just about anyone whose ancestors lived or worked in the south in those years right after the Civil War. The records reflect a massive effort by the federal government first and foremost to assist the newly freed slaves in their transition to lives of their own. There are records of labor contracts as the freedmen sought employment, rather than servitude, after the war. There are the first ever real vital records for this community, as the freedmen sought to obtain recognition of their marriages and the legitimacy of their children. There are records of schools for the freedmen and free children — often with the first ever records of those children and their accomplishments. And there are records of the terrible clashes between the members of a society accustomed to being served and those no longer obligated to serve, and the role of the Freedmen’s Bureau in trying to obtain justice for the freedmen in a system stacked against them. It provides a view of the southern legal system that can’t be found in the records of the southern courts — an unparalleled opportunity to see how the system worked, and how it didn’t, in those years. For descendants of slaves and slaveowners, the records help break through the issues of a system that left slaves with first names only — if even those were recorded — before the 1870 census. African-American research is dramatically aided by access to these records. But the records are more than that. They reflect a massive effort also to stabilize the southern economy and bring the former rebel states back into the Union. So you’ll find evidence of relief provided to huge numbers of southern residents devastated by the war, and the interactions of ordinary citizens with government. And why the indexing? Because just having these records digitized isn’t good enough. Finding our needle in that government haystack is always a challenge — and these records are too valuable not to be mined for every single clue they offer to every American family with southern ties. Getting the names indexed so we can all find the right records for our research is key. The goal for Thursday night is 900 batches in 90 minutes. It’s doable — if we all pitch in. And besides… what else do you have going Thursday evening? A political debate? Come on and join in. I’m in! My 3rd great-aunt, Elizabeth Frances “Miss Fannie” Harvey taught in a black school in Lynchburg, VA after the Civil War. I didn’t find this until a couple of years ago when I happened on a reference in the Virginia Memory collection. Since my ancestors in that line were slaveowners it was a very pleasant surprise. I wish I could have known her. I would be happy to make these records more accessible. Good for you, Nan! They’re great records. I’ve done some indexing in this project and found it both fascinating and fulfilling. Two things: I have Viking heritage as manifested in Dupuytren’s syndome (one of those DNA things), which considerably affects my typing speed. 900 batchs in 90 minutes– uh, uh. But I’ll get as many done accurately as I can manage, and have fun doing it. The other thing: I fully expect to be in bed an on my way to sleep by 9:30 pm EST. Early riser, east coast, and all that. But I’ll be on board early to make up. Carry on!